4 0 • r e s t a u r a n t d e v e l o p m e n t + d e s i g n • J A N U A R Y / F E B R U A R Y 2 0 1 9 THE OUTFITTER S electing a cost-effective, on-trend mix of materi- als, finishes and furnishings for the casual-dining segment requires keeping a few key considerations in mind. Designers need to not only understand the particular brand and concept, of course, but also the rapidly changing dynamics within the segment and their implica- tions for outfitting front-of-house spaces. 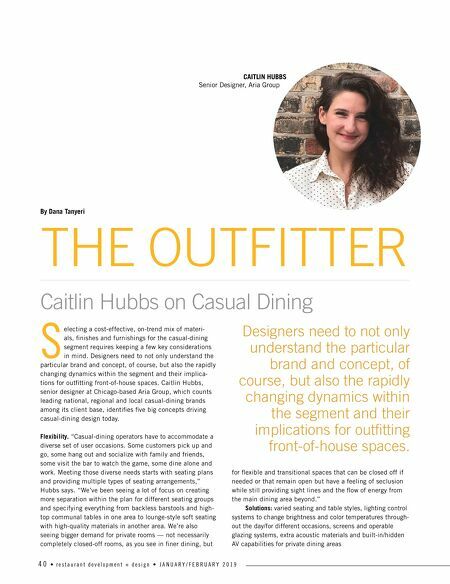 Caitlin Hubbs, senior designer at Chicago-based Aria Group, which counts leading national, regional and local casual-dining brands among its client base, identifies five big concepts driving casual-dining design today. Flexibility. 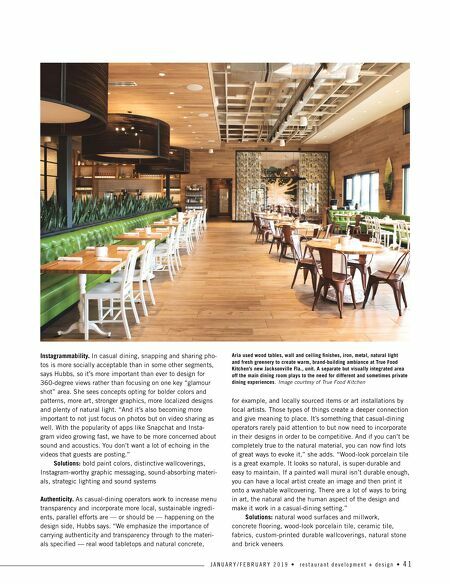 "Casual-dining operators have to accommodate a diverse set of user occasions. Some customers pick up and go, some hang out and socialize with family and friends, some visit the bar to watch the game, some dine alone and work. Meeting those diverse needs starts with seating plans and providing multiple types of seating arrangements," Hubbs says. "We've been seeing a lot of focus on creating more separation within the plan for different seating groups and specifying everything from backless barstools and high- top communal tables in one area to lounge-style soft seating with high-quality materials in another area. We're also seeing bigger demand for private rooms — not necessarily completely closed-off rooms, as you see in finer dining, but for flexible and transitional spaces that can be closed off if needed or that remain open but have a feeling of seclusion while still providing sight lines and the flow of energy from the main dining area beyond." Solutions: varied seating and table styles, lighting control systems to change brightness and color temperatures through- out the day/for different occasions, screens and operable glazing systems, extra acoustic materials and built-in/hidden AV capabilities for private dining areas Caitlin Hubbs on Casual Dining CAITLIN HUBBS Senior Designer, Aria Group By Dana Tanyeri Designers need to not only understand the particular brand and concept, of course, but also the rapidly changing dynamics within the segment and their implications for outfitting front-of-house spaces.